Pickled Elephant Garlic A member of the leek family, Allium ampeloprasum like all garlic doesn’t produce viable seed. In spring mammoth scapes appear and can be harvested when flower buds form. For all types of garlic removing the flower buds directs the plant’s energy into bulb formation. These are a delicacy when sautéed. Come back for a recipe in late spring. Pickling is a natural for these large mild cloves. 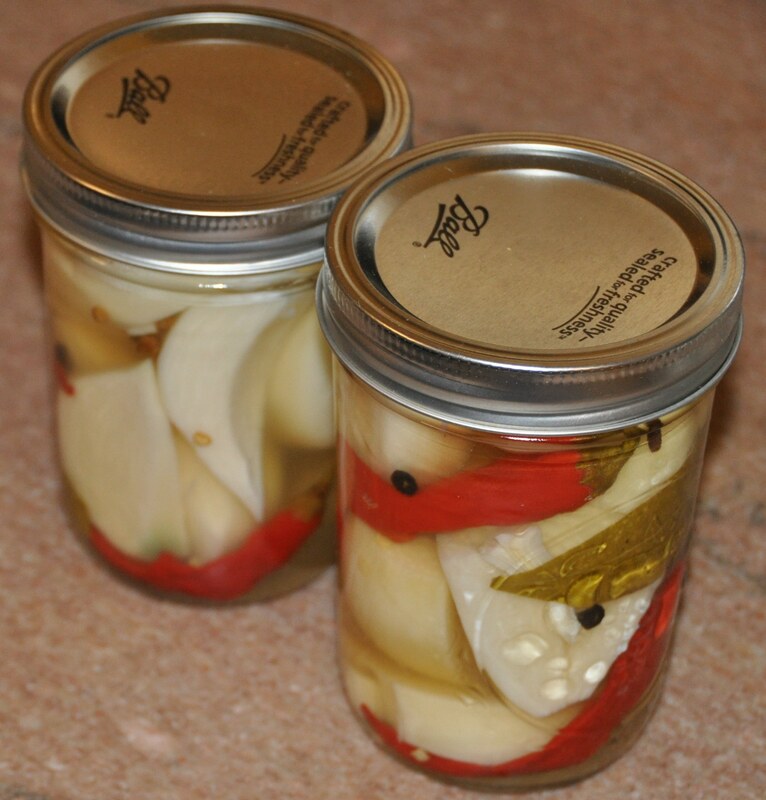 So I offer you this recipe with the greatest respect for those who develop pickling recipes. The flavors change and develop over the first six weeks and even longer and it is important to have it acidic enough to not cause botulism. The vinegar mixture needs only brought to a boil and then poured into the jar. Vinegar boiled in an open kettle for more than a few minutes will evaporate acetic acid reducing overall acidity. Directions: separate bulbs from garlic heads. Remove the skins and trim the root base. Cut bulbs lengthwise into three sections. In a saucepan put vinegar, spices, sugar and salt on to heat. Put canner or stockpot on to boil with enough water to cover jars during processing. Put lids into hot water to soften while jars are prepared. Slit peppers with a knife tip in 3-5 places. Place pieces of garlic, a bay leaf and peppers into freshly washed rinsed jars. Dip a spoon into brine, scoop out spices and add to jars. Add hot brine mixture to jars leaving ½” headspace. Wipe edges with a clean cloth or paper towel. Cover with heated lids and gently tighten rings. Place jars in simmering waterbath. Jars should be covered by no more than an inch of water. Bring water to a strong simmer and once bubbles begin rising to surface process for 12 minutes. Remove jars from kettle and cool. Because I’m intimidated by any thoughts of spoilage or botulism my jars go into a refrigerator, another good reason for the small batch approach. The lids will be depressed as a sign of sealing. Your garlic should be fresh and is ready to eat in ten days but I prefer six weeks. I like to cut into sections when serving. A true garlic aficionado may want a third of a clove or more.